Charm Krizia L. Medina - MOSVELDTT Law Offices - Pasig City, Metro Manila, Philippines. 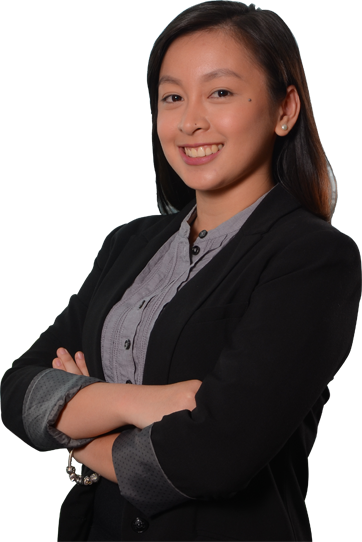 Charm graduated with a Juris Doctor degree from the De La Salle University – Manila in 2015. She was admitted to the Philippine Bar in 2017. She worked as an intern with the Public Attorney’s Office in 2014, where she garnered experience in drafting various pleadings and conducting client interviews with indigent clients. She also served as a research assistant for the Office of the University Legal Counsel of the De La Salle University – Manila from 2013 to 2014. In 2011, she served as an intern in a Philippine Senator’s office where she was tasked to write session reports and briefs. Charm also obtained her undergraduate degree from the De La Salle University – Manila in 2011, where she took up Bachelor of Arts, Major in Political Science. During this time, she interned with the La Salle Institute For Governance (LSIG) where she served as Secretariat in the international training course on Research and Capacity Building in collaborative governance organized by LSIG, in partnership with the University of Colombia. Charm is involved in Energy, Labor, and Corporate Law, mainly for clients in the public utilities industry, including Dispute Resolution and Arbitration. She also handles corporate house keeping, due diligence, contract review and drafting, as well as other special projects.